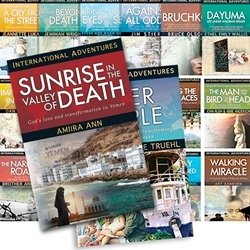 YWAM Publishing - INTERNATIONAL ADVENTURES SERIES&lt;br&gt;Set of 17 Books&lt;br&gt;&lt;br&gt;Save 50%! Amazing true stories of spiritual victory and personal triumph. On every continent, in every nation, God is at work in and through the lives of believers. From the streets of Amsterdam to remote Pacific islands to the jungles of Ecuador and beyond, each international adventure that emerges is a dramatic episode that could be directed only by the hand of God. The following are 17 titles from our popular International Adventures Series. See below to purchase the books individually.